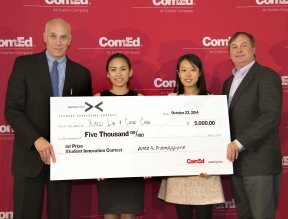 On October 23rd, ComEd awarded student team Xinli Lin and Szu Ying Ching from the Illinois Institute of Technology (IIT) a check for $5,000 for receiving first place in ComEd’s Student Innovation Contest. The contest challenged students attending universities and colleges within ComEd’s service area to envision products, services or software apps that leverage smart meter technology to help low-income customers better manager their electricity usage and save money. Lin’s and Ching’s winning concept outlined a prepaid electricity program that featured a prepaid value card, real time tracking of account balances, and the presentation of customized energy savings tips and rewards.